A good hot tub cover is a necessity to keep your hot tub hot, clean, clear, and ready for use. Here at Pool World, we provide a variety of hot tub covers to choose from including covers for Hot Spring, Caldera, Lime Light, Free Flow, Tiger River, and Solana. Other brands we carry include Sunstar Custom Hot Tub Covers, Smartop, Be-lite, and Covana. Each of these may be customized to meet your hot tub cover needs. 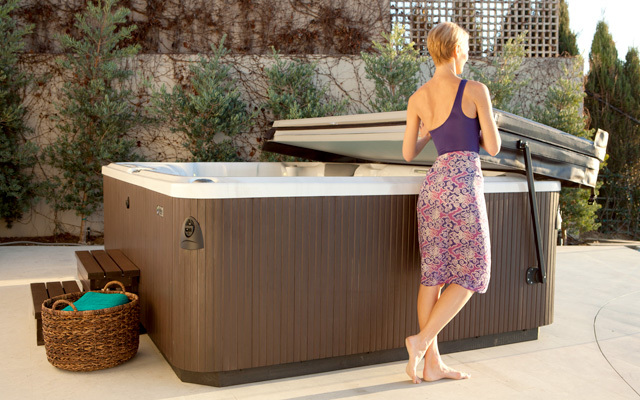 Everyone has a different reason of why they use and love their hot tub. Entering your hot tub should never get in the way. Pool World provides options you need to create an easy and safe entry into your hot tub. Pool World has a history of selling Hot Spring, Caldera, Lime Light, Free Flow, Tiger River, and Solana hot tubs and when it comes time to replace your hot tub cover we provide either a manufacturers or custom cover as an option for a perfect fit.